The past week I have been fighting all sorts of battles, ones that can only be solved with a proper gun and enough ammo. I had the chance to be one of the first to try out a new and upcoming game called Hazard Ops. This game takes you into a wild rollercoaster ride where having enough ammunition is a life and death matter, and not needing to reload at key moments can be a blessing from the heavens. Hazard Ops, the EU publication of what’s known as ZMR stateside, you will be forced to tackle a variety of challenges either alone, with friends, or against other thinking players looking to put you down. Before I go fully into detail on my thoughts of what Hazard Ops does well and where it lacks, let’s lay out exactly what sets it apart from most free to play shooters. 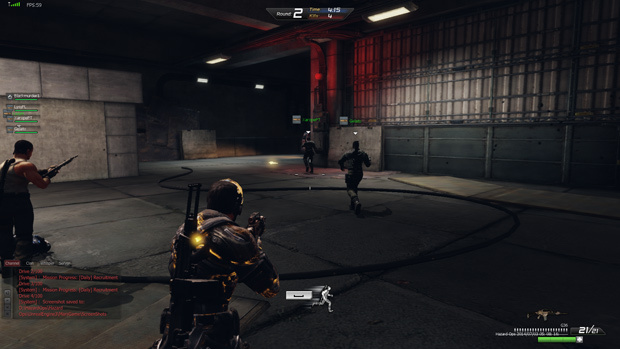 In Hazard Ops you will face all sorts of challenges, typically consisting of a boatload of enemy soldiers, zombies or monsters of a set theme. They want to kill you, and you will have to survive through a wide variety of maps and scenarios. While there are rare exceptions, most modes base success around raiding an enemy base to take out its boss, or bunkering down and protecting your home base through the onslaught. Now let’s talk how the game plays out. You can play Hazard Ops alone, but it’s a hollow experience. I would definitely recommend you to try it out with others gamers you enjoy playing with. Whether taking a stroll through Zombie Park with friends or complete strangers though, you will quickly learn the brotherhood that is required to get through the difficult levels. When you are ready to go and have picked the weapon set that will carry you to hell and back, the gauntlet will begin. One the first match, most players make the mistake of going wild with a spray and pray mentality. I assure you that tactics and stealth go a long way in Hazard Ops though, as the rambos will run out of ammo and serve as nothing better than a meat shield for the core players. I have always been a big fan of these arcade type shooters that force you to make it from point A to B rather than mindlessly and repetitively slaughtering enemy players again and again. The only downside is they can get repetitive if there aren’t enough levels to challenge yourself with, but Hazard Ops already packs a ton of them, and each are huge with tons of epic moments to keep the adrenaline pumping from log in to log out. 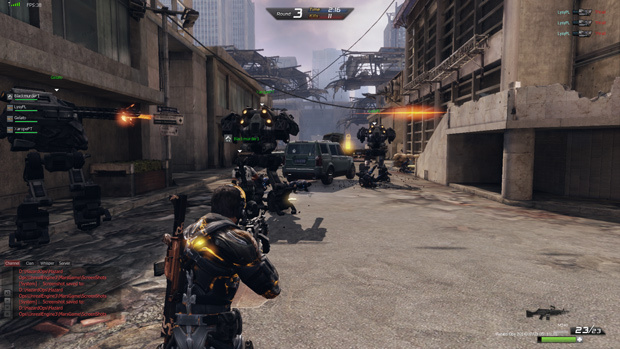 Hazard Ops is played in the third person view, with a variety of weapons from your typical modern armaments to oversized gaiting guns and swords. But as goofy as it might feel to run into a horde with a katana, you’d better be on your game as some of the bigger enemies are packing melee weapons of their own to put you in your place. Choosing the right weapon for the right moment is key, and sometimes takes some trial and error to figure out. Some levels feature objectives that require you to drop off supplies or utilize extra tools to disable traps. 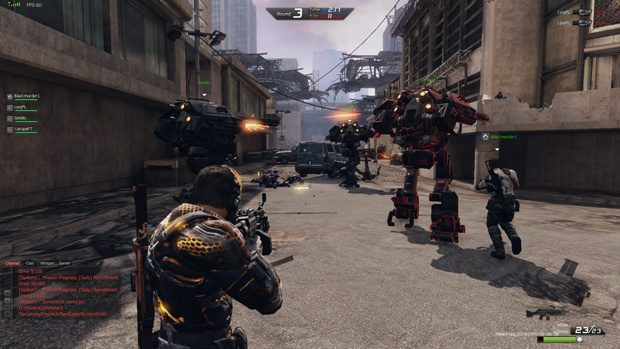 Robot levels feature turrets and even mech suits you can climb into to gain a fighting chance. Mini-bosses are also scattered throughout the level to ensure rounds don’t just become a mindless slaughter of minions. It’s a thrill knowing you need to rely on your teammates to take these bosses down through strategic means that adds a more standard MMO feel to the typically soloist shooter genre. But besides the many enemies you will be facing, there are also a lot of dangerous environmental gameplay elements that you should watch out for. Moving lasers are especially fun if you do not figure out their pattern, because instead of moving right through them, you have to activate your mission impossible moves to sometimes live through it all. 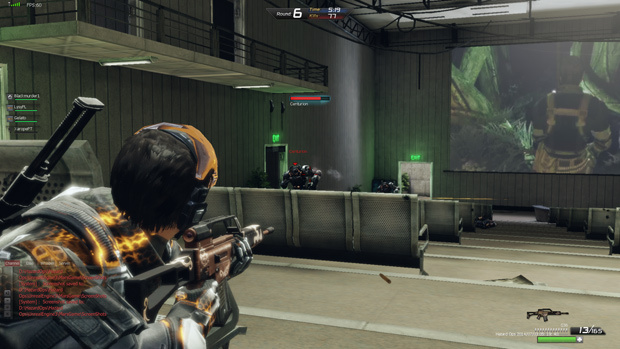 Besides teaming up with other players all the time, you can join competitive scenarios with two opposing human sides. Essentially it’s PvPvEvEnvironment. Gameplay speeds up noticeably in these battles as humans can take you out with much less warning than the typical monster. Humans are also a lot less predictable as they could be bringing any of the numerous weapons available into a fight. To get the right weapon for putting your thinking foes down, you can head into the shop where you can find all sorts of items that can be bought with real money or in game money, but do note that most items have a level requirement so don’t be like me trying to buy all the good items in the shop before my account level was ready for them. Leveling your account up will also unlock new challenges to breathe new life into familiar maps and monsters. Finally once you feel you are a true master of Hazard Ops, you can put your confidence to test in ranked matches. Hazard Ops literally takes a mixture of a wide variety of games, and blends this perfectly together into something that feels relatively new. Currently the game is still in closed beta, but I had a glimpse of some of the open beta content such as player controlled monsters, and can’t wait to test these modes out more on the live server. It didn’t take long for addiction to set in, as did nostalgia of an older generation of shooters more focused on challenge completion and story advancement than esports. It is a concept you do not see regularly lately, and especially not within the free online realm. If you are a big fan of third person shooters, you should definitely check it out. If you want to try the EU servers out, you can do so right now! We’re giving out 1500 beta keys in our giveaway section right now.